And in particular, Smyrna (now Izmir) in W Turkey. Paradise Lost: Smyrna 1922 - The Destruction of Islam's City of Tolerance by Giles Milton, 2008. 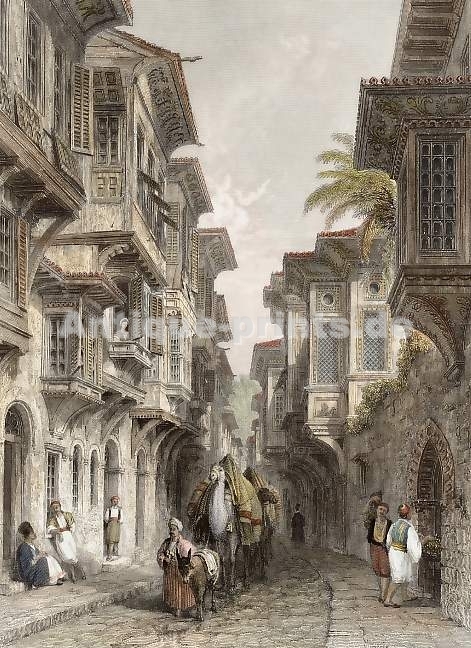 "A Street in Smyrna", engraving of 1838. Smyrna, in what is now W Turkey, was one of the first Christian communities in the world, and is mentioned in Revelation. See also the 2nd century AD mathematician Theon of Smyrna. Part of the Ottoman Empire from 1426, Smyrna was for centuries a prosperous trading port to rival Constantinople. It was largely Greek and Christian for centuries under Turkish Islamic rule. The Turks called it "Smyrna of the infidels". The Western powers established commercial bases there (by agreement with the Ottoman Empire) as early as the 16th century (e.g. the English government-backed Levant Company established 1581), and many western merchants lived there with their families. For centuries Smyrna was a cosmopolitan place with a large permanent European population. The westerners, from many different countries in Western Europe, tended to marry among themselves, and all the families ended up related. The Maltass family went out there from England in the mid-18th century. Throughout the 18th and 19th centuries, the Ottoman Empire was in a long period of slow contraction from its former greatest extent. The 18th century saw a series of wars with Russia and Austria, who took much Ottoman territory. Russia annexed the Crimea from the Turks in 1783. Another Russo-Turk war started in 1787. Austria declared war on Turkey 1788. The war ended 1792. Around 1800, the Levant Company controlled the trade in opium to the West, out of Smyrna. The import and use of recreational opium in the West remained legal throughout the 19th century, before the modern era of prohibition. The narrow Straits of the Dardanelles (the gateway to Turkey and Russia from the Mediterranean) were always of huge strategic importance. In 1807 an English fleet under Admiral Duckworth forced its way through the Straits of the Dardanelles in a historic display of rising European power (and declining Ottoman power), and intimidated Turkey. At this point Britain was allied with Russia against Napoleon's France. Turkey was allied with France. The Levant Company was wound down in 1825, and privately owned companies such as the Whittall companies became more important. Greece proper became independent of the Ottoman Empire in 1832. Though Smyrna and many other Greek and Christian territories remained under Ottoman rule. In the 19th century this area became vital to the European balance of power. Gibbon and de Stentzsch and Herbert were involved in the Crimean War 1853-56. Territorial expansion of Greece (1832-1947). As the Ottoman Empire collapsed, the period 1894-1923 saw the extermination or expulsion of most of Turkey's ancient Christian populations (Greeks and Armenians), and the emergence of the completely Muslim country of Turkey. During WWI, The Ottoman Empire was on the German (Central Powers) side, while Greece was on the Allied side. Smyrna was one of the few places to escape the 1915 Turkish genocide of the Armenians, and the city still retained its ancient cosmopolitan character at the end of WWI. After being on the losing side in the war, the Ottoman Empire was occupied by the Allies. Greece occupied Smyrna and surrounds in May 1919, and began to expand their territory, immediately starting a new Greek-Turkish war. The Allies supported Greece's expansion into Turkey. There was a large Greek and Christian population living in the area occupied - and it was these who suffered terribly when the Greek army was routed. The Greek army was defeated by Kemal Ataturk, Turkish nationalist leader and founder of modern Turkey, who captured the Greek hold-out Smyrna in Sept 1922. His troops burnt the Greek and Armenian part of the city and slaughtered the Greek and Armenian population. Rudolph J. Rummel estimates that the Turkish army under Ataturk massacred 100,000 Greek and Armenian Christians at Smyrna. The fall of Smyrna saw the ethnic cleansing of the ancient Greek population of Turkey (there was also a large ethnic cleansing of Muslims from Greek territory). The Turkish drive stopped at the sea (today, Greece controls as far as the islands just off Turkey's coast). Where did the European population of Smyrna stand on this? Presumably many of them opposed the Greek invasion in the first place. Though it seems unusual for any of them to have supported Ataturk. Ataturk's revolution was supposed to set up a state that was secular and westernised, in opposition to the old Muslim society. Yet his followers seemed motivated by a more primitive Turkish nationalism, Islamic religious feeling, and a hatred of non-Muslims and non-Turks. The Maltass relations were split. The Whittall family supported the Greeks. The Wood family and the Giraud family supported the Turks. After the Turkish victory, Europeans that supported the Greeks had to flee. After centuries in Smyrna, the Maltass/Whittall family and relations were split up, and spread all over the world. Many other European merchants, banks and companies, whether they had supported the Greeks or not, pulled out during this period. For some Europeans, despite what was happening around them, life seems to have gone on much as normal. A number still live there today (including members of the Maltass/Whittall family). But it was the end of Smyrna's long history as a cosmopolitan western city. Also called the Pontic or Pontian or Hellenic genocide. Chrysostomos of Smyrna, killed 1922. The burning of Smyrna and the massacre of 100,000 Christians (1922) by the Turkish army under Ataturk. Smyrna is now Izmir. See images and images. Bournabat is now Bornova, on NE side of Smyrna (now part of greater Izmir, see map). Boudjah is now Buca, on S side of Smyrna (now part of greater Izmir, see map). Levantines (Europeans still living in Turkey today). Also here. 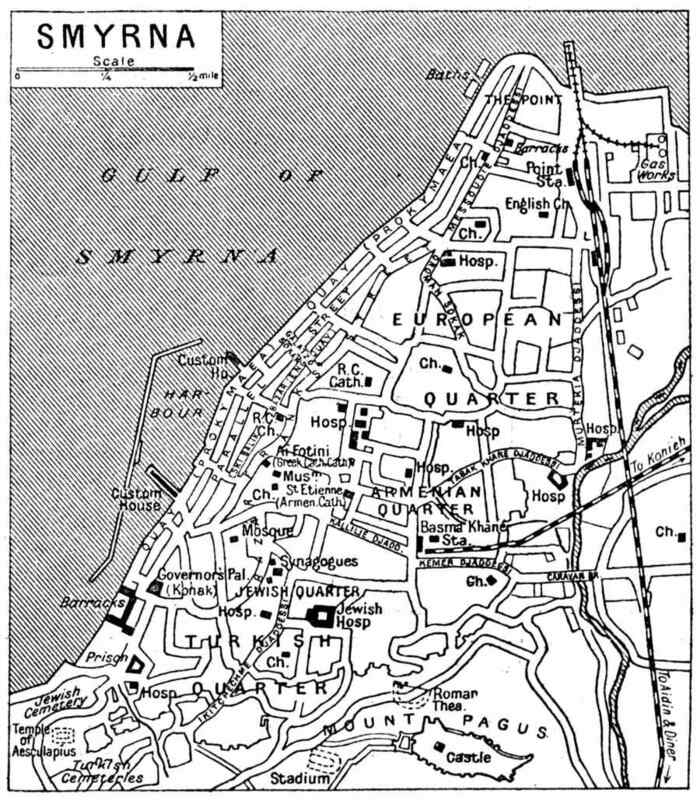 Most of the European families in Smyrna had winter/trading/town houses in the port/city of Smyrna, mostly near the quayside, and summer/family/country houses at places near Smyrna, in particular at Bornova (Bournabat).